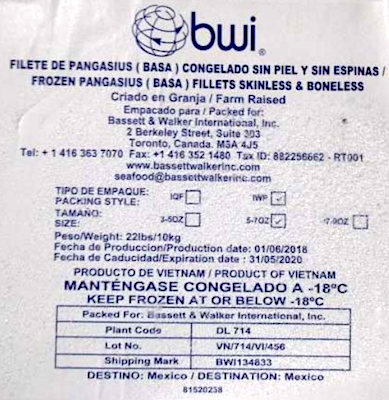 According to the USDA, the Basa Fish products subject to recall were distributed by McAllen Cold Storage, Ltd., the importer of Record, establishment number “EST. V21273.” These items were shipped to wholesale and retail locations in Texas. Upon arrival at retail locations, the Basa Fish Fillets may have been removed from boxes and placed in the seafood display case for consumer purchase. The problem was discovered when an US Department of Agriculture’s Food Safety and Inspection Service (“FSIS”) investigator conducted an inquiry to determine if McAllen Cold Storage received imported Pangasius Frozen Basa Fish Fillet products originating from the country of Vietnam. These products are also subject to recall. If you believe you have purchased or have in your possession any of the recalled Basa Fish Fillet products, please do not consume them directly nor use them as an ingredient in another dish or preparation. Instead, kindly return the product to the distributor or outlet where you purchased it for a full refund. ==> To see other recalls and notifications caused by contaminated, adulterated or mislabeled Siluriformes Fish, please search for “catfish” or more generically, “fish” using the Search Box at the top of this page. If you have any questions about this recall notification, please contact Mr. Miguel Alva, Sales Supervisor at Pro Valley Foods at 1-956-800-4019 during normal business hours Central Standard Time, Monday to Friday. ==> To see other recalls and notifications for products manufactured, marketed and/or sold by McAllen Cold Storage, Ltd. please search for “McAllen Cold Storage, Ltd.” using the Search Box at the top of this page. ==> To see other recalls and notifications for products manufactured, marketed and/or sold by the BWI brand, please search for “BWI” using the Search Box at the top of this page.